The Muhimbili University of Health and Allied Sciences traces its origins to 1963, when it opened as Dar es Salaam Medical School. The school became the faculty of medicine of the University of Dar es Salaam, in 1968. In 1976 the Faculty of Medicine was incorporated into Muhimbili Hospital to form the Muhimbili Medical Centre (MMC). The Parliament Act No. 9 of 1991, upgraded the faculty to a college of Dar es Salaam; the Muhimbili University College of Health Sciences (MUCHS). In 2000 the Government by Act of Parliament dis-established MMC and created two closely linked, but autonomous public institutions: MUCHS and the Muhimbili National Hospital (MNH). Over the years MUCHS made significant achievements in increased student enrollment and development of several new academic programmes. The Parliament Act No. 9 of 1991 that established MUCHS was repealed in 2005. 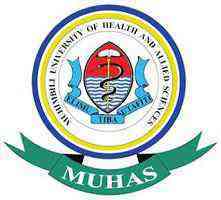 In 2007, MUHAS was established by Article 1 of the Charter of Incorporation, in line with the recommendations of the Tanzania Commission of Universities.